What I want is a movie of The Exploits of Mr. Saucy Squirrel and The Further Exploits of Mr. Saucy Squirrel by Woodrow Wyatt (Lord Wyatt of Weeford, 1918-1997), illustrated by Gareth Floyd, Geo. Allen & Unwin, 1976 & 1977. These are veddy British pastiches of the Paddington Bear stories. 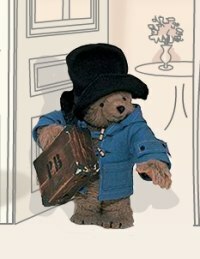 Where the Paddington Bear tales are gentle learning parables for young British children – Paddington Bear comes from Darkest Peru to London, is adopted by a middle-class family, and has humorous misadventures “helping” Mrs. Brown in her trips to the supermarket, accompanying the Brown children to elementary school, taking a bath, shopping for holiday presents, etc. – recognizable attempts of a very young child to copy older siblings and adults – Mr. Saucy Squirrel has similar experiences, but very upper-class: how to pick a fashionable tailor, how to hire a contractor to build a mansion, how to book a suite at the most exclusive hotels, how to develop a stable of racing horses, how to stock a cellar of the finest wines, how to have valuable antiques appraised, etc. The advice is designed for British 7- to 10-year-olds and is entirely realistic; but how many 7- to 10-year-olds would be in a position to take advantage of them?